Electrochaea is a German-based company that took over the mission of solving some of the most pressing challenges facing energy systems in the future: surplus electricity storage and integrating fluctuating renewables into electricity grids. Electrochaea has developed a commercially viable and disruptive power-to-gas solution for utility-scale energy storage, grid balancing, and carbon reuse in order to confront these challenges. What if stranded power could be harnessed and stored as chemical energy for later use? Using a conversion process known as “power-to-gas”, Electrochaea has developed a commercially viable and disruptive solution for utility-scale energy storage, grid balancing, and carbon reuse. Their proprietary process converts low-cost and stranded electricity and carbon dioxide into pipeline-grade renewable gas for direct injection into the existing natural gas grid, a conversion process known as “power-to-gas”. 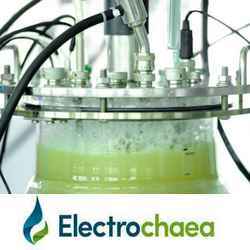 Electrochaea technology permits CO2 capturing, unlimited energy storage and the production of permanently renewable methane. Compared to traditional upgrading facilities, this technology doubles the methane output, improves your carbon index and permits access to additional carbon related credits when available. With a grant of $1.2 million from the Danish Energy Agency (EUDP), the company tested their power-to-gas technology in using a 10,000-liter reactor vessel and raw biogas as a carbon dioxide source. The system ran continuously for more than 3,200 hours between August and December 2013 at Aarhus University’s Biogas Research Center in Foulum. Electrochaea’s BioCat project demonstrates commercial scale power-to-gas technology to address Europe’s needs to integrate renewable power, gas and energy storage. The BioCat plant has operated for more than 3,000 hours as of January 2018. The goals for current operations are to achieve full system automation and refine the BioCat techno-economic model for profitable operation in the current Danish energy environment. The core of the BioCat project is Electrochaea’s BioCat methanation system, which employs a unique biological catalyst that stores renewable energy in methane. Electrochaea GmbH is a dynamic early stage company with headquarters, engineering and development teams in Munich, Germany, and a commercial scale demonstration facility in our Danish subsidiary. The Electrochaea story starts in the year 2006 with basic research and four years of proof of concept in Prof. Laurens Mets’ laboratory at the University of Chicago. In 2011, first field trials with raw biogas at a brewery digester in St. Louis, MO, Electrochaea LLC demonstrated that the technology was compatible with untreated industrial biogas sources. Visit Electrochaea’s Website to know more!